To accomplish adaptability to sanding surface, a flexible sanding plate is affixed through rubber mounts to a set of rockers/gimbals, which are than mounted to the sander's handle. Pressure is spread directly from the tool’s handles to the base plate. 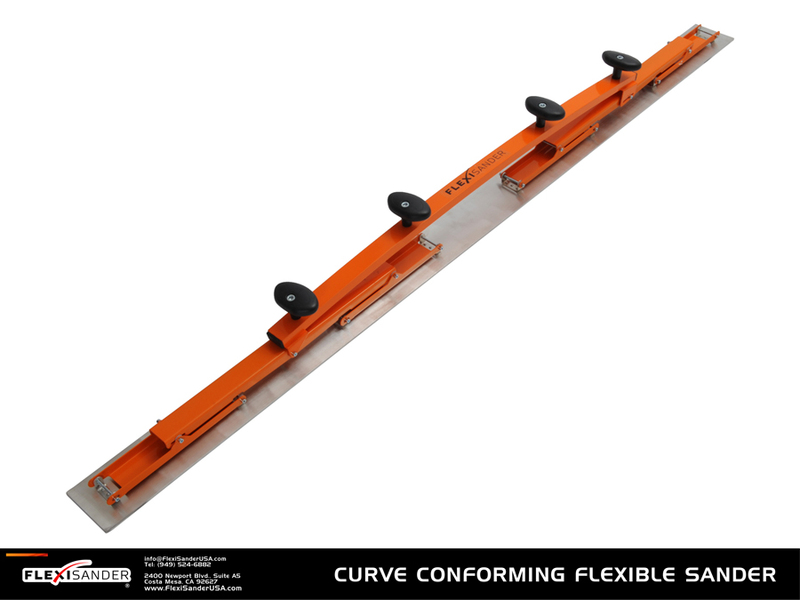 This allows you to work on a variety of surfaces; large, small, curved or flat. Since the sanding plate is flexible, it will allow work to be performed on local, small areas as well. FlexiSander's durable construction and flexible sanding board body enables you to apply even pressure over the entire surface, achieving results superior to any other sander on the market. • makes curved surfaces perfect, wether they are convex or concave. • up shaped ends of the filling/sanding board do not leave any scratches. • two different sets of grips, a curled grip and a stick grip (depending on your work habits). • Velcro surface attaches stick-on sanding sheets. How to use this tool? Simply hold it up to the surface and slide it back and forth, just like you would any ordinary sander. With FlexiSander, sanding is easy, fast and precise. Conquer convex, concave or flat surfaces with precision and efficiency! Excellent when used in combination with FlexiSander FILLING tools. © 2019 FlexiSander USA, All Rights Reserved.